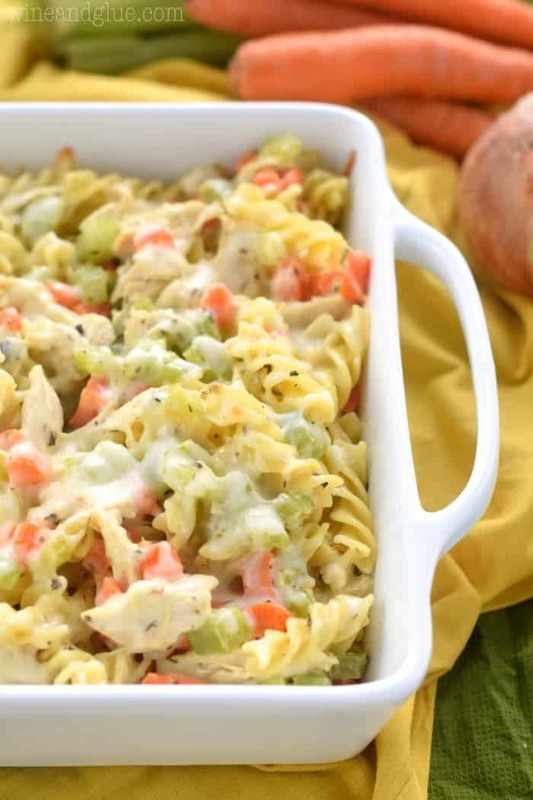 Chicken Noodle Soup Casserole is the perfect definition of comfort food! A perfect weeknight dinner! You guys, I’ve had a song stuck in my head for the last few days. SO ANNOYING. Primarily annoying . . . because I DON’T KNOW WHAT SONG IT IS! I’m guessing that this is the definition of getting old. Having a song stuck in your head, or like the idea of a song, and not being able to actually remember the damn song. So normally when this happens, and yes, I’m that old, it’s happened before. Normally when this happens, I have at least like a sequence of four or five words that I can google and get the name of the song and play it and then the incessant itching in my brain stops. But this time? No, not so much. Just the tune, sort of and like three words . . . that weren’t actually in ANY SEQUENCE! So I texted my husband in a huff, because seriously if it was going to keep me awake at night, it had to be dealt with. Do I have more important things that I should be doing? ABSOLUTELY. It turns out that if I had to save my life by humming, the results would be . . . . sad. If I had to save my life by baking a casserole that tastes like Chicken Noodle Soup, I would be made the Queen of England. 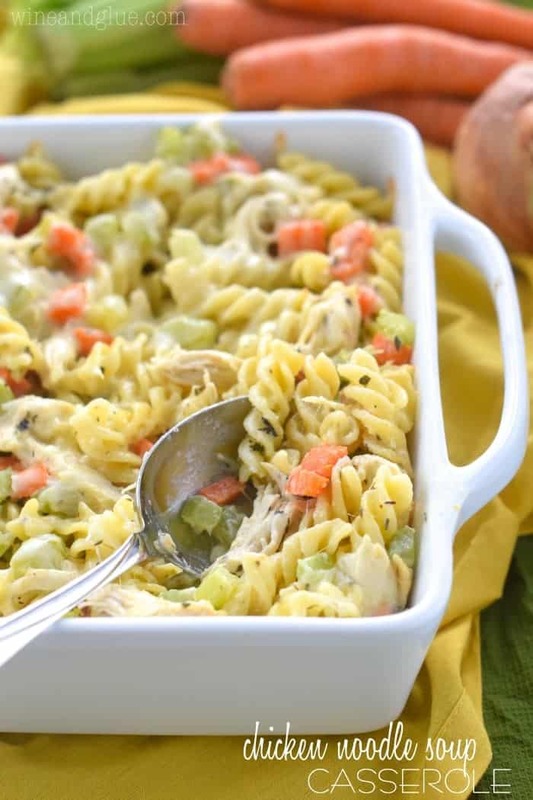 Chicken Noodle Soup Casserole! The noodles are boiled in chicken stock to really deepen the flavor of the casserole and give it that traditional chicken noodle soup taste. Then I threw in some bay leaves for good measure, celery, carrots, and chicken (#duh). I made a nice roux to get it all creamy, added some cheese and baked her up. And my picky pickerson eaters crowned me the Queen of England. The End. The noodles are cooked in chicken stock, I like just using chicken stock base, because it’s cheaper, so when the water for the pasta came to a boil, I just threw in like 6 teaspoons. When I tell you to slowly pour in the liquid after making your roux (the point in the recipe where you’ve mixed in the flour and are about to pour in the milk), I don’t mean a slow pour, I mean approximately a tablespoon of liquid, stir it in like crazy, approximately a tablespoon more and stir some more. That’s the only way to get the bad boy to thicken. Nathan hates onions, so this casserole has no onions. It should have onions. Throw in a diced smallish one with your celery and carrots. Make sure to taste the sauce once you add all the milk, that way you will know how much salt and pepper to add. 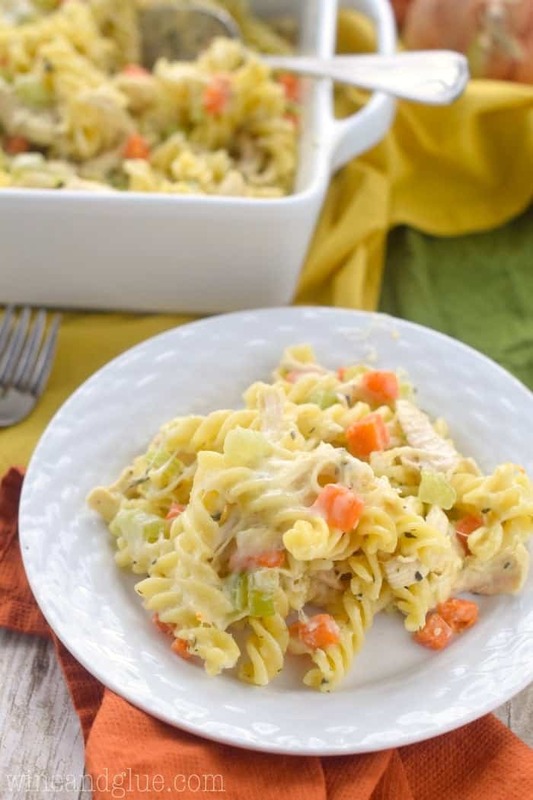 This Chicken Noodle Soup Casserole is a perfect weeknight dinner. Total comfort food. Preheat your oven to 425 degrees. Spray a 9 by 9 casserole dish with cooking spray and set aside. Cook the pasta in chicken stock with two bay leaves thrown into the water according to package directions. Drain and set aside. Melt the butter over medium low heat in a large sauce pan. Add the celery, carrots and garlic to the pan. Cook until the veggies are soft and tender. Add the flour to the pan, mixing it in to make a paste. Very slowly add the milk, approximately a tablespoon of milk at a time, waiting until the last bit of milk was completely combined before adding the next bit. Once all the milk is mixed in, add the thyme and basil. Then season to taste with salt and pepper. Stir in the chicken, cooked noodles, and and one cup of the cheese. Pour the mixture into the greased casserole dish and top with the remaining 1/2 cup of cheese. 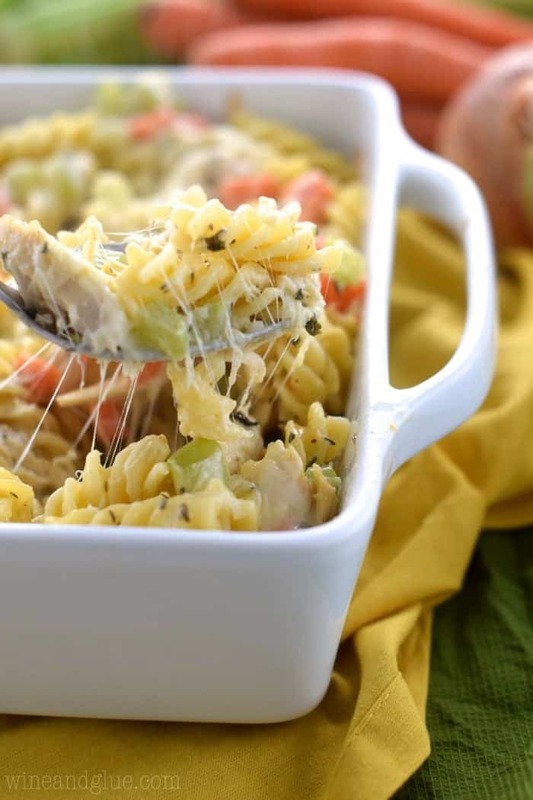 Great recipe – my wife loves casseroles, so I bet she will like this one…somehow I feel like chicken noodle “soup” is only for when you are sick, so I like the idea of all the same ingredients in an everyday casserole. Hi! 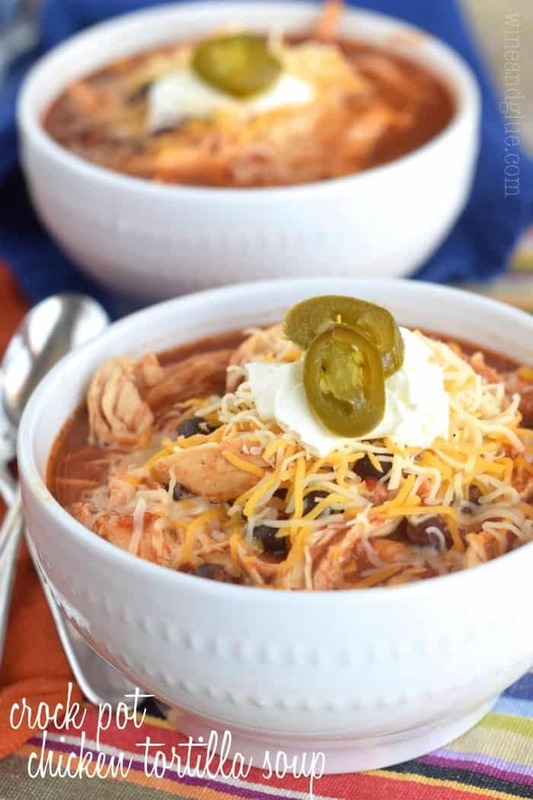 Just made this recipe tonight….it was great!! Just a note that there isn’t a step to add the pasta. Also this recipie half-ed really well. Literally cut everything in half. I also used penne instead. It really was delicious!!!! Thanks!!! Oh my gosh, Lisa! I’m so sorry! I am the Queen of missing steps/ingredients in recipes. I feel like I do it with every other recipe. Eeeek! Thank goodness for kind readers like you who point it out. I’m so glad you liked it! Made this tonight and it went over pretty well. I ended up using 16oz rotini just b/c it’s what I had, and homemade chicken stock. With that much pasta it filled a 9×13, so I upped the flour to 3T and more cheese :). The amount of basil and thyme were a bit much for us since they weren’t simmered or anything, so next time I will cut it in half. 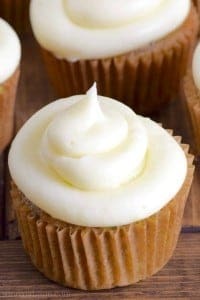 Already have this recipe put into our rotation of recipes! 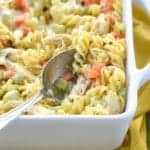 Love the flavors of chicken noodle soup, but isn’t always appreciated during the warm months, this is the perfect answer! Glad your family liked it Rebecca! Do I remove the veggies before making the sauce or do I add the flour in with the veggies? I hope you like it Lisa! Yum-O! As a previous reader indicated, this is ideal for this time of the year – when you might not want hot soup, though I like soup ALL year long. I used light cream (because that’s what I had instead of milk) and added some fresh basil and thyme from my herb garden. This is definitely a keeper! I think I will eventually try different cheeses, too – just to see how they taste. ps Hope you eventually remembered the song! Fully Alive recently posted…Me First! I’m so glad you liked it! Thank you so much for taking the time to come back and leave this comment! I don’t do a lot of repeats from my blog, one of the downsides to this job, but this comment makes me remember how good this casserole was and makes me want to make it again! This looks awesome! I would like to use a 9×13 pan. (My family would laugh at a 9×9 pan! 😉 ) Should I just double the sauce and cheese? (I can eye ball the veggies…) Thanks! Can’t wait to try this! Ha! I would think for this recipe that the bigger pan and doubling it will work totally fine, just keep an eye on it because I’m not sure what the cooking time will be without doing it myself, you know? It turned out fantastic! SO YUMMY! I used the same stock I used to cook my chicken to boil the noodles and I added onions to the veggies (my kids love them.) I used my stove to oven pan so it was super easy! Definitely a keeper, thanks! This was fantastic! I love soup, and this way the toddler was able to enjoy it too. Fixed this tonight it was delicious my family loved it! Changed one thing when sautéing the vegetables I waited till they were close to done and then added the Italian seasoning and basil cooking it till vegetables were tender instead of adding it just before putting in the oven. I’m so happy you liked it Angela! 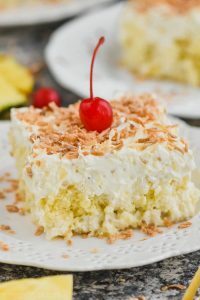 I just recently stumbled across this recipe and have now made it for my family twice. We all love it!! This one will be repeated often. Thanks! Thank you so much for taking the time to come back and let me know, Karin! I’m so happy you liked it! Just about to put this into the oven and wanted to let you know that you didnt include when to turn the heat off the stove. Smells delicious and can’t wait to eat it! 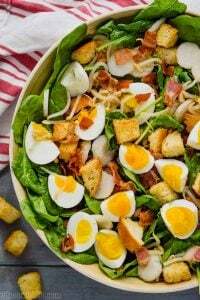 This recipe looks great and not too complicated for someone like me, who is not too experienced in the kitchen. I was just wondering what piece and quantity of the chicken you used to get 2 cups worth. Thanks, looking forward to trying this! Hi Sarah! I use cooked chicken breast, about two breasts will get you 2 cups. But honestly you could use any part, or left over turkey! 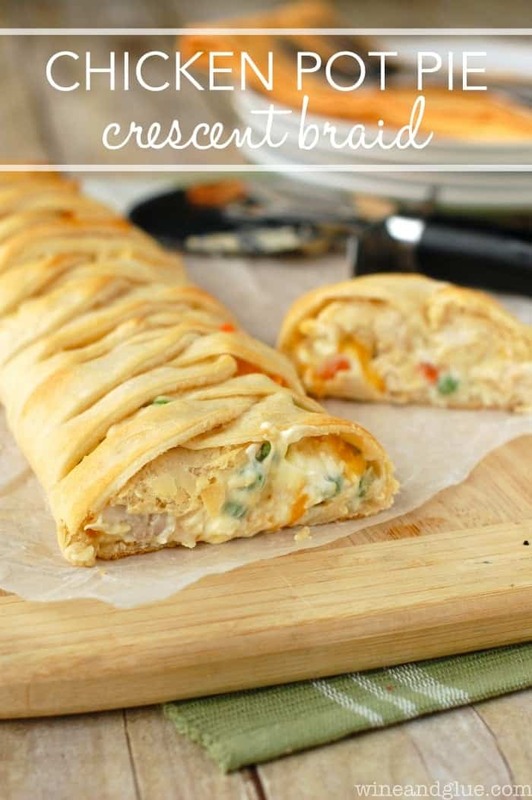 Just made this with our leftover Thanksgiving turkey and it was amazing! My toddler even gobbled it up. My husband immediately asked that it be added to our regular meal rotation. I did cheat a bit and use the Trader Joes mirepoix mix just to make it quicker. Perfect weeknight meal! I’m so glad you liked it Karen!! Could this recipe be made without the cheese? My husband isn’t a cheese guy. It definitely could be, Beth, but it might not be quite as tasty and it my also be a little bit dry after the baking, so I would likely just skip that step. Would substituting peas for the celery work? If so what qty would you suggest, frozen or in a can and if frozen, should I cook them first? Thanks!! Peas would be a great sub Jen! I would use frozen, don’t thaw it, use about 1/2 a cup to a cup and toss it in when you toss in the chicken. Let me know how it turns out! I am currently prepping for baby #3 and think this would be good, any suggestions on freezing and reheating? Brandy, it’s been a while since I made this guy, but I think it would freeze pretty well. I also have a TON of soup recipes that I think would freeze well. Good luck with baby #3! I love having three! I tried this and it’s a new favorite of my family! 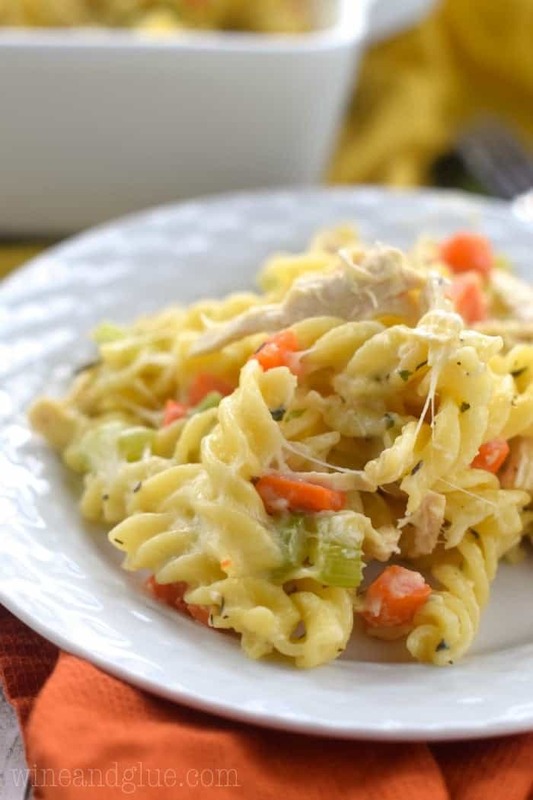 Why do you use cheese, as that is not an ingredient usually in chicken noodle soup? Is it possible to make this without any cheese, or is it necessary for cohesion or flavor? I used cheese because that is a basic ingredient in casseroles, and this is like a fusion of the soup and a casserole. You could definitely try it without cheese, I love experimenting with recipes, but I personally don’t think it would be as good. A friend of mine made this for me right after I had a baby. She assembled the casserole, wrote the cooking instructions on top of the aluminum foil, and told me I could keep it in the refrigerator until I was ready to cook it. So perfect. I had to get the recipe and now I make it for people who are sick or just had a baby, too. It’s easy to double the recipe, and you can freeze it, too. I love this comment so so so much Teralyn! I’m so happy to hear you love this recipe and that you are passing it on! We just made this casserole and it turned out great! thanks! Made this and loved it. Had plenty of leftovers, since hubby and kiddos turned their noses up at it at first. (They weren’t home to experience how amazing it smelled while cooking!) But I coaxed them into trying it and they all loved it too…even the picky eater! Delish! ???? I’m so happy your family loved it, Jamie! thanks for the recipe! I like how slow cooker recipes are very easy to customize to individual preferences – like you mentioned you can choose your favorite enchilada sauce or choose to mince garlic instead of doing the powder. My mother and I had a better than average relationship growing up so we were somewhat close. Kiddo and I get along truly well and she converses with me about a considerable measure of things she doesn’t converse with her father (my center points) or her mother since she doesn’t see me the same as them. Her mother has disillusioned her thus there is no trust there. Thus, I am protected. I trust she will keep on feeling safe with me and trust in me since we have an awesome confiding in bond. I made this on Sunday, DELICIOUS. My daughter is in Color Guard and we have a band competition this weekend and we make a ton of food the judges and directors. 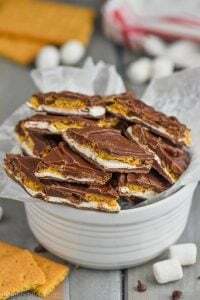 I’m going to make 2 trays of this. The only difference I’m going to make is 1/2 cup milk and 1/2 cup chicken broth to give it more of a chicken flavor. I make a pot pie and I mix the milk and broth and it’s delicious. TY for sharing this. Wonderful!! !